!! 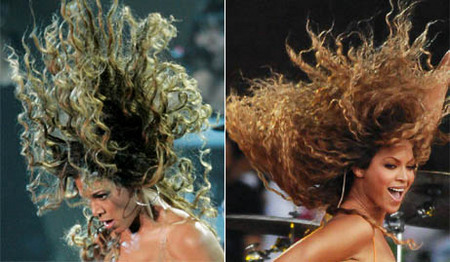 OMG, how wild: Beyonce’s hair !! Beyonce must sometimes wake up in the night wondering what large cat has crawled into bed with her. 3 Comments on "OMG, how wild: Beyonce’s hair"
I dont see anything wrong with her hair flying during a performance and you like many others are trying REAL hard to find something wrong with her, if you have any luck please post it!!! Not really…. since ONTD showed that her real hair is the length of a bob. She’s simply sitting several hours every day to have her hairstylist glue her lacefront on.